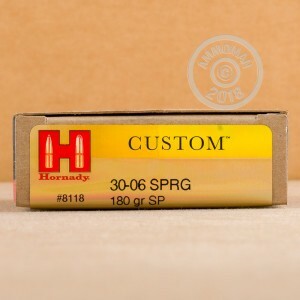 Count on Hornady cartridges to deliver when you looking to put trophies on the wall or venison on the table. They're a great choice for a wide variety of game including deer and elk. These .30-06 Springfield cartridges fire a 180 grain Interlock soft point bullet that delivers high diameter expansion without risk of fragmentation or core-jacket separation. A muzzle velocity of 2,700 feet per second results in flat trajectories and excellent long-range accuracy. 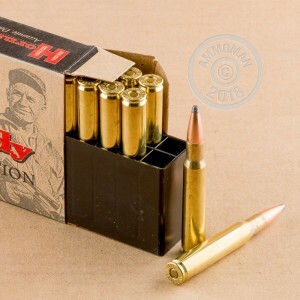 This ammo is loaded in the USA in boxes of 20 and uses non-corrosive primers and brass cases. Place an order for $99 or more at AmmoMan.com and get free shipping--no codes to redeem and no gimmicks. I cannot trust these rounds while hunting as they are discolored or not new with finger prints other corrosion issues. Even if reloads they were not cleaned properly before the reload process. I will not purchase again for this reason.